Smartphone cameras were once a novelty, with consumers merely grateful that they could take photos and snap the occasional video without having to lug around a standalone shooter. But now, the camera is considered an essential component, and in the past few years especially, the standards have been greatly improved by OEMs. With Samsung having added 4K support to the Galaxy S5 earlier this year, Apple countered with a much-enhanced point-and-shoot experience for the iPhone 6 and iPhone 6 Plus, and if you were under any illusion as to the pedigree of the latest iPhone’s camera credentials, the short movie below will leave you in no doubt. 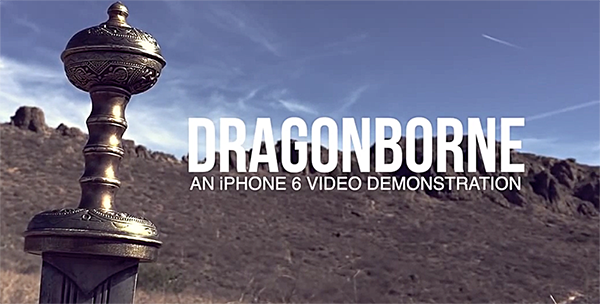 The clip, entitled “iPhone 6 Short Film: DragonBorne“, has been uploaded to YouTube by one Matthew Pearce, and as noted at the beginning of the video, every single aspect of the sequence was shot and edited using only the iPhone 6. It’s of the polished quality that one might expect when watching a movie or TV show at home rather than one captured on a mobile device, and not only underlines why many experts consider the iPhone 6’s snapper to be the very best ever seen on a smartphone, but also leads us to consider an ever-nearing day when professional video editors will no longer require the power and might of a MacBook Pro in order to get the job done. Of course, creating the clip with the music and special effect character wasn’t achievable at stock level, and a number of powerful apps must share the credit for creating this short masterpiece. iMovie, Filmic Pro, Efexio, Movie Looks, Gravie and Video Crop all played a part in the short film, and with such a pro-looking result, the iPhone looks like the perfect beginner’s tool for those looking to become professional film makers in future. Without any further ado, here’s the clip in question. Even if you have an iPhone 6, it would still take a degree of knowledge and skill to be able to replicate this outcome, so while the handset has certainly excelled itself, major kudos must also be given to Matthew Pearce for his supreme editing talent and also, a steady hand throughout the scene. Exposure changes noticeably, most viewers probably won’t care though. Could be done better on an Android. Impressive…..even though this could be created on any other smartphone out there….including older iphones…..but what the heck iPhone 6 is what we need to advertise. please i need to watch an android made video like this, must be awesome, could you give me a link? ?